Akaroa, in the Canterbury region of the South Island of New Zealand, is an idyllic seaside village with a delightful French influence, a legacy left by many of the early settlers. The tranquil harbour is nestled in the crater of a long extinct volcano and is surrounded by steep mountains which provide stunning vistas across the entire Banks Peninsula area. Our tour starts at the harbour’s edge, climbs over mountain ranges for fantastic views, celebrates the beautiful and native flora prized in this area and the cherished history of this region. Susan C "We took the cruise ship and had a wonderful day -Highly recommend!" Fran G: "We took the cruise ship and had a wonderful day -Highly recommend!" Our journey begins with a drive through the village and around the harbour’s edge before climbing up to the summit, some 500 metres above sea level, stopping along the way at strategically located lookouts which provide marvellous photo opportunities. We’ll continue along to the small rural town of Little River and then past two significant Lakes: Forsyth and Ellesmere, before climbing again onto the Summit Road from Gebbies Pass to the Sign of the Kiwi. From our vantage point high on the Summit Road we take in dramatic views of Lyttelton Harbour and township and the Pacific Ocean. Our next stop is at the Sign of the Takahe, where an easy 5 minute walk takes us to a lookout which provides a magnificent overview of Christchurch City, the Canterbury Plains, the Southern Alps and the Pacific Ocean. As we descend into Christchurch City we acknowledge the resilience of the people of Canterbury who continue determinedly to rebuild, repair and replace after the devastation of the earthquakes of September 2010 and February 2011. The evidence of the earthquake damage is still clearly visible, but so too are the signs of recovery as this once beautiful City is reimagined and gradually restored. Fortunately a significant number of Christchurch Heritage buildings survived the ravages of the earthquakes, and remain as a visual link to our Colonial past. We’ll visit some of these historic places and also the thriving rebuilds that are providing the locals a welcoming way to restart their community. The city centre now boasts a world first with a “Cardboard Cathedral” and a unique and very quirky “pop up” restart mall, constructed from brightly painted steel shipping containers creating an ingenious way of restoring the commercial heart of the city. It also gives locals - and tourists! - a happy place to gather and shop, or simply watch buskers and listen to music. At the conclusion of our tour of the Central Business District we will return to the Re-start Mall for lunch at own cost. 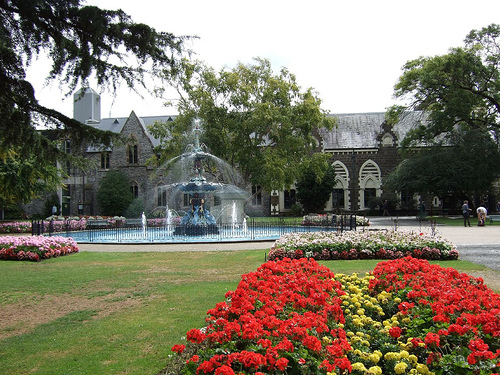 Our next stop is the celebrated Christchurch Botanic Gardens. The rhododendrons and azaleas are magnificent during spring and then roses, dahlias and hydrangeas take centre stage in summer. Considered by many visitors to be the best in the world, the beauty and tranquility are a real highlight on this tour. On our journey back to Akaroa we take the Tourist Drive along the Summit Road. The views down into some of the East Coast Bays and into Akaroa Harbour itself are stunning, and at every turn in the road new vistas open up. We’ll be sure to stop for some photos to bring your memories of this special and unique part of New Zealand home.